There are different ways to handle corrections, depending on whether the bundle is closed or open. For returned checks (NSF), the process is a little different, so refer to the help article for Returned Checks. If the bundle needing the correction is for scanned checks, see the help article below. Go to the individual’s people record and select the Giving > Statements tab. Click the amount beside the correct year. This will open Contributions > Search filtered for that individual and for that year. Find the specific contribution and click the Reverse button, under the Actions column on the right of the page. This removes the contribution from the original bundle and from the donor’s record. If the contribution was a check for multiple funds, be sure to Reverse all items. Now, create a new bundle for just that one contribution, using the same Contribution and Deposit Date as the original contribution, and enter the correct total for that new bundle. Click Actions > Post Bundle / Edit and record the contribution to the correct person and fund, and then Close the Bundle. You can also go to Administration > Contributions > Search , filter for the individual, the date range or check #, and then click on the name of a donor in the list. This will switch the view to contributions for only that donor. At that point, just proceed with Step 3 above. The original bundle will now be reduced by the amount of the reversal as will the total contributions for the individual. The original bundle should never need to be re-opened, so it is appropriate that the total for the Bundle Header no longer matches the Total Items. Reversals do not display on a person’s Contribution Statement nor does the original contribution. We do not recommend that you open a bundle that is already closed, just to make a correction. It is better protocol to use the above outlined process. 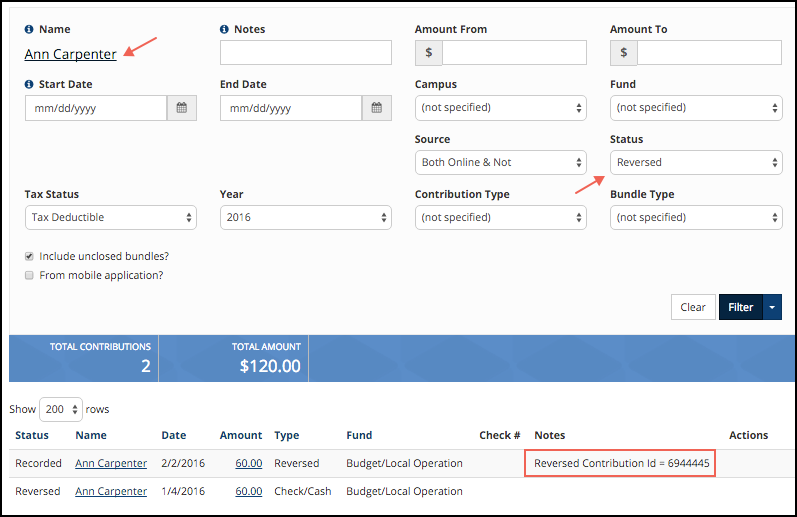 Go to Administration > Contributions > Search , filter using the original donor’s name, and select Reversed as the Status . Click Actions > Edit beside the contribution that needs correcting, and then enter the correct People ID # or correct name, or select the correct fund, if that is what needs correcting. Tab to move to the other fields. If the contribution was a check for multiple funds, be sure to Edit all items, if the change is because of an incorrect donor.